Published: July 3, 2013 at 05:23 p.m. Updated: July 5, 2013 at 02:27 p.m.
A warrant for the arrest of San Francisco 49ers linebacker Ahmad Brooks was filed in error, Santa Clara County Assistant District Attorney Karyn Sinunu-Towery told NFL.com and NFL Network on Wednesday. "It was a complete fumble on our part," she said. That fumble concerns an application submitted Thursday to Judge Sharon Chatman seeking an arrest warrant on a felony assault charge with great bodily injury. Police documents, which can be downloaded here, indicate that Brooks allegedly struck 49ers nose tackle Lamar Divens three times in the head with a beer bottle on June 8 and then punched him in the face during an argument about Brooks' readiness to drive after drinking alcohol. A judge signed the arrest warrant last week, but one day later, higher-ranking officials decided to put a hold on the case, according to the San Jose Mercury News. Divens initially wanted to press charges against Brooks, but he changed his mind five days after the incident. "He said this would be bad for both of their careers and that he just wanted to keep playing and that they had resolved it," according to the documents obtained by the Mercury News. Divens, signed in February, hasn't appeared in an NFL regular-season game since 2010. "We have not completed the investigation," Sinunu-Towery told NFL.com and NFL Network. "We recalled the warrant. We will announce next week whether or not we will press charges. I just want to confirm: There is no warrant outstanding. There is no arrest outstanding." It remains possible that Brooks could be charged. Until then, the 49ers won't say much. 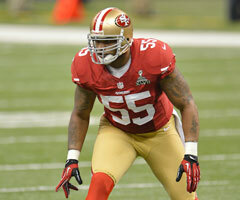 "We are aware of the situation involving Ahmad Brooks," the 49ers said in a statement to NFL.com and NFL Network. "Out of respect for the legal process, the club will have no further comment at this time."